I have to admit that when first seeing this book and reading its synopsis I thought of the movie 'The Space Between Us!' Does that make me more intrigued to read this book further? Am I more inclined to potentially compare the two even though they are different entities? Yes and Yes! But all comparisons come with good intentions and just as much as I loved the movie, I loved this book even more. We follow Leo and his two friends Orion and Libra as they are about to go on a mission to a "home" they have never seen. For the past sixteen years they have grown up in zero gravity on the space station Moon 2 and this embarkment to Earth will forever change their lives. So I have been seeing a lot of people comment on the text speech and how this has really bothered them and even had some not move forward with the book. For me, I LOVED it! I have not seen a book written this way in so long and it was refreshing. Do teens still text this way? Not really. But that's okay because I am sure there is someone out there right now doing this and is able to connect with this book in more ways than I can. Moving on! I have to admit that science fiction books are not my strong suit in books I lean towards reading but every now and then there is that one book that will open up my eyes and send me shooting for the stars. That one book was this one. I was immediately transported to Moon 2 and floating along with Leo, his friends, and Victoria as they fly through space preparing for this mission. There is this LGBTQ aspect to the story in Leo's unvoiced crush on Orion and even though that was not the point of the story, I did want it to expand into something more but like I said not a main issue in the story. The take on Earth was very interesting and the fact on what NASA has been holding back to these teens who are about to go somewhere that could be more troublesome than they had prepared for. But what is new with adults holding information back from teens. Overall Nick Lake has captured my heart and sent it off to a galaxy among the stars. 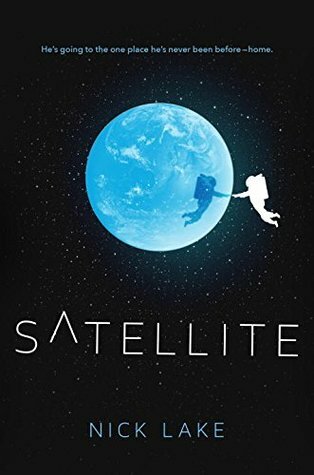 If you are looking for the next great sci-fi novel that brings the feeling of The Martian for teens, this is your novel. An interstellar success!